Enjoy Bear, Mule Deer, & Archery Elk Hunts with the Best Big Game Hunting Outfitter Headed by Experts! Meet the team of Big Timber Outfitters LLC. 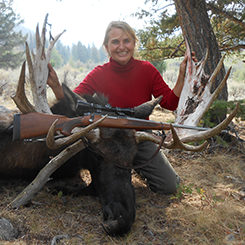 in Salmon, Idaho, that works hard to ensure your bear and archery elk hunting experience is the best ever! At your hunting outfitter, we pride ourselves on hunting 100% wild and free roaming animals. For pictures of our expert guides, we invite you to view our slide show. Billijo Beck grew up on a cattle ranch in the mountains of Idaho helping her father (an Idaho Outfitter) from the ground up, starting out as a horse wrangler at age 9. From a young age, she spent time in the outdoors assisting her father with packing and outfitting, slowly moving up the ladder to become a packer, then a guide. Her time spent on the ranch provided her with excellent equine skills, earning her many state and regional awards for horsemanship. 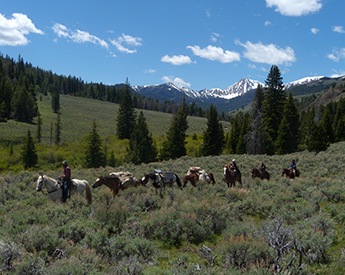 An accomplished horseman and guide, she loves her job and has become a Top Guide with a great understanding of nature and habits of Big Game animals, especially in the backcountry. She has an uncanny ability to locate trophy animals. 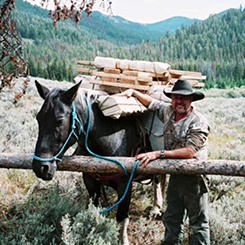 Terry Beck literally grew up hunting and riding in the Gila National Forest and is an accomplished hunter, horseman, and backcountry expert. The years he spent riding bulls on the rodeo circuit helped to hone his already tremendous survival skills. Terry is very much at home in the mountains and works hard to make your hunt enjoyable and hopefully successful. Contact us today at (208) 993-1688 or (208) 993-0194 in Salmon, Idaho, for more details on our bear and elk hunting professionals. For more pictures of our expert guides, we invite you to view our slide show.